When bathing with water is difficult or impossible in an outdoor environment, No Rinse Outdoor Body Wash is the perfect solution. Just apply to body, massage to lather then towel dry. That's it! Leaves you smelling and feeling great. The ingredients in No Rinse Outdoor Body Wash produce a cleansing action that leaves skin feeling fresh, clean and odor free. No water and no rinsing required. Perfect for any situation where water bathing is not an option. 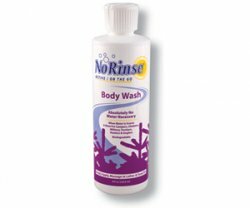 No-Rinse Outdoor Body Wash is commonly used by the military, outdoorsmen, truck drivers and has also been used in outer space. That's right, Nasa has approved No-Rinse Body Wash for use by our astronauts. It has also been approved for medical use where daily bathing is required but not an option and is safe for daily use even on the most sensitive skin. Just wanted to thank you for helping me out even though it was my mistake. It's not everyday that I come across folks as understanding and as helpful as you.